June 21, 2013 - For 35 years, the Boeing 727 aircraft were a reliable workhorse for the world’s largest express transportation company. Today, the venerable 727 narrow-body freighter closes an enduring chapter in aviation history as FedEx becomes the last major carrier to retire the aircraft from service. The retirement is part of the company’s aircraft modernization strategy. 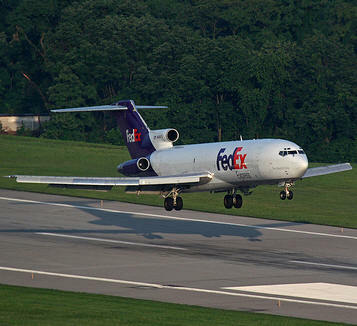 The 727’s domestic mission concluded at 1:30 p.m. CDT as FedEx aircraft N481FE touched down at the FedEx Express World Hub at Memphis International Airport. History of the 727 at FedEx - Introduction of this larger, mid-size jet freighter to the FedEx fleet was made possible by deregulation of the airline industry in 1978, giving the upstart express carrier access to more domestic markets and bringing immediate operational efficiencies because of greater payload capabilities. FedEx operated only small Dassault Falcons before the industry was deregulated. An exemption then allowed a company to enter the common carrier business if its payloads were less than 7,500 pounds. Not only are FedEx 727s being retired, but nearly half of the fleet has been donated coast-to-coast to aviation schools, colleges and local communities in the last several years. From Anchorage to Austin, from Billings to Buffalo, from Sioux City to Shreveport and many points between, FedEx aircraft donations support school curriculums that are developing the next generation of aviation professionals. The donated aircraft are also being used for training by emergency response teams at local airports and fire departments.